When you’re looking for comfort food, you don’t usually need to look much further than a helping of Welsh Rarebit. 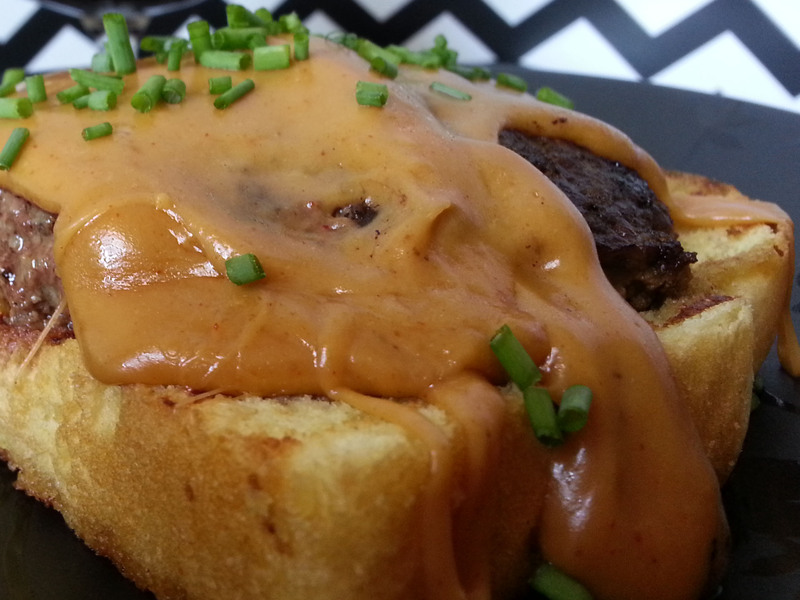 For those of you unfamiliar, it’s simply a delicious beer-cheese sauce over a piece of toast. It’s warm and hearty and makes you feel happy all over. So how about you take that… and slide a big fat burger into it!? Perfect. Just perfect. Open-face sandwich to the extreme. Begin by dividing your beef into four sections. Shape into patties and make them slightly thinner in the middle. Salt and pepper each side. Preheat a grill pan over high heat. Drizzle a tbsp or two of olive oil into the pan. Cook the burgers for 4-5 minutes per side (medium-rare to medium). Meanwhile, begin preparing your cheese sauce. Melt butter over medium heat, then stir in flour. Cook until slightly brown and fragrant (3-5 minutes). Add in mustard powder, pepper and paprika, then whisk in beer and Worcestershire sauce. Whisk until Smooth. Add in cheese, half at a time. Whisk until smooth and melty. Toast the bread. 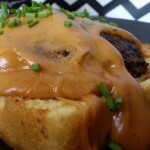 Serve burger and a healthy portion of the cheese sauce over top the toast. Garnish with chives if desired.